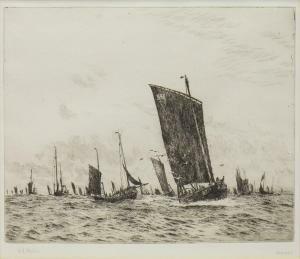 Find artworks, auction results, sale prices and pictures of William Lionel Wyllie at auctions worldwide. 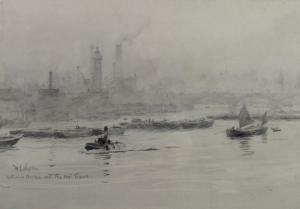 William Lionel Wyllie RA, RE, RI (British, 1851-1931): 'Waterloo Bridge and the Shot Towers', with tug and smack to the fore, pencil drawing, with watercolour wash en grisaille and erasures suggesting light on the Thames, signed and titled in pencil to the drawing, with number '8' lower margin, 25 by 35cm, framed, 45 by 55cm. 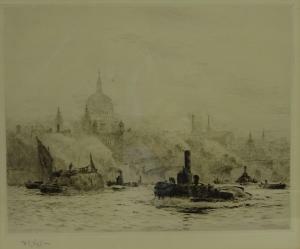 Description: William Lionel Wyllie R. A, R. W. S (British, 1851-1931): 'Waterloo Bridge and the Shot Towers', with tug and smack to the fore, pencil drawing, with watercolour wash en grisaille and erasures suggesting light on the Thames, signed and titled in pencil to the drawing, with number '8' lower margin, 25 by 35cm, framed, 45 by 55cm.